She may not look like much, but she’s got it where it counts, kid. 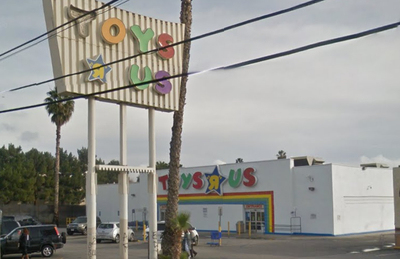 The Toys ‘R’ Us in Panorama City, California still stands, forty years gone by since I was a kid staring up at what looked like miles of Star Wars action figures on the pegs. I can still remember the path through the store to get to them – I haven’t been in there in decades, so maybe the layout is different now. But once in the store, I could get to those figures faster than anyone. My kindergarten has been demolished, since replaced by an apartment building. My elementary and middle school buildings still stand, but the school long ago went out of business, and now some other outfit runs the space. My high school was flattened by the 1994 Northridge earthquake, and eventually re-opened in another location. So much of my childhood has disappeared, but that Toys ‘R’ Us is right where I left it.